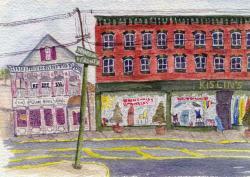 There used to be a place on Front Street in Red Bank called Kislin’s Sporting Goods. It wasn’t like anything anywhere, before or since. They sold boots, tools, camping gear, basketballs, neat’s-foot oil, model airplanes, kerosene heaters, dolls: an astonishing array of wildly different merchandise not put in the store by any particular category or any discernable arrangement. It was kind of dark in there. They had a couple of light fixtures way up in the ceiling and this vast cavern full of shelves and piles of stuff apparently put down wherever there was room. Little League uniforms were over there by the varnish. An old guy, Mr. Kislin maybe, just sat – we thought he must be crippled, because he never moved – while a guy named Bob, his son maybe, went and got whatever you asked for. Browsing was definitely out. A hatchet? Be right back. Gardening gloves? Hold on. Kislin’s started out in 1908 as a sporting goods store, but had morphed into a sort of wacky outdoorsy-department store for everything no one else in town carried. As if the old man were listening every time somebody asked for something (“Tee shirts?” “Airplane glue?”) and then ordered it so he wouldn’t miss a sale. That’s where my Mom took me for my chinos. Dickies, they were called. Cotton-and-Dacron, wash-and-wear, straight leg, tan pants. Kislin’s kept them piled up against the tent poles. Nothing high-falutin’ about Dickies, but I wouldn’t wear anything else. Forget Haggar, forget Lord & Taylor, forget everything. We went to Kislin’s for Dickies and that was that, until probably eighth grade. They went out of business a few years ago. The old man had died long since, and his son Bob opened up a sporting goods store in the Eatontown Mall. He called it Bob’s.